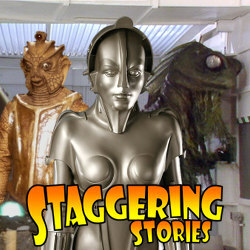 Staggering Stories Podcast #183: Do Fake Trees Dream of Jip and Pain Baker? 02:30 — Doctor Who: North Korea gets it. 03:36 — Doctor Who: Ben Miller guest starring. 04:29 — Heroes Reborn: Missing its Cheerleader? 06:07 — Masters of the Universe: New director for the new film. 07:20 — Terrahawks: Big Finish audio plays. 10:27 — Joss Whedon: New film In Your Eyes available now. 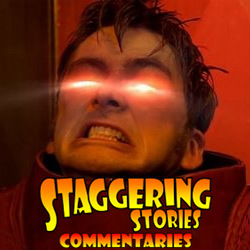 11:02 — Doctor Who: British Pathé news reels featuring Doctor Who. 11:50 — Orphan Black: Back on BBC Three on 30th April 2014. 12:24 — Karen Gillan: Hair donated to Star Wars VII. 13:34 — Peanuts: Film teaser trailer now at large. 14:00 – Doctor Who: The Mark of the Rani. 29:09 – Game: Guess the Kinder Surprise toy. 31:23 – Game: Cards Against Humanity. 55:58 – Game: Guess the Kinder Surprise toy. 64:39 – Farewell for this podcast! 65:21 — End theme, disclaimer, copyright, etc. Wikipedia: Masters of the Universe. Joss Whedon’s In Your Eyes. Wikipedia: The Mark of the Rani. BBC: Doctor Who – The Mark of the Rani. Adam J Purcell, Andy Simpkins and Keith Dunn sit down, unearthed, in front of the Babylon 5 third season episode, ‘Messages from Earth’, and spout our usual nonsense! 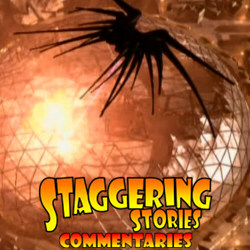 The Lurker’s Guide to Babylon 5: Messages from Earth.